“The unique New Year's Festival in Philadelphia—A procession of Masqueraders passing the Post-Office,” 1892. Throughout much of northern Europe and colonial North America, groups of mummers roved from house to house during the Christmas season, entertaining their hosts and expecting food, drink, or a small tip in return. Mumming and belsnickling in southeastern Pennsylvania persisted into the 1800s, not only in Philadelphia but also in smaller cities like Easton, Lancaster, Pottstown, and Reading. 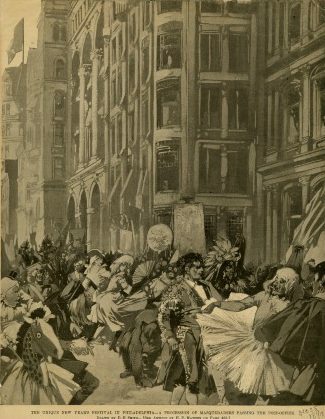 This 1892 illustration shows an artist’s rendering of the raucous holiday celebrations that predated the first city-sponsored Mummers Parade in 1901. Comic Club Badges from the M.A. Bruder New Year’s Association, 1908-1916. Decorated with photo portraits and silk and metallic trim, these individual identification badges from the M.A. 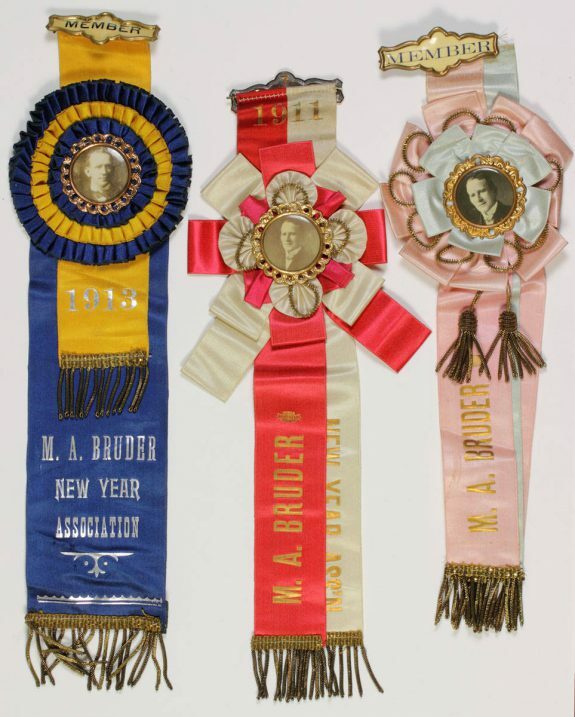 Bruder New Year’s Association were worn in the early Mummers Parades. 1. The comic division (or “comics”), focusing on satire and clowning. 2. The wench brigade division (or “wenches”), emphasizing a traditional, burlesque style of female impersonation. 3. The string band division (or “string bands”), featuring live music by large ensembles of banjoes and brass. 4. The fancy club division (or “fancies”), displaying elaborate costume design. 5. The fancy brigade division (or “fancy brigades”), concentrating on Broadway-style staging and choreography. 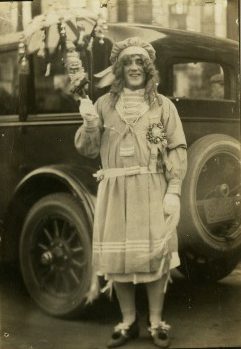 This photographic postcard (1924) depicts an unidentified mummer in a typical wench costume. 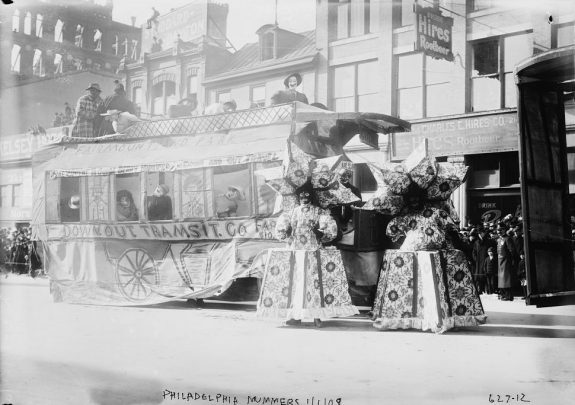 Streetcar Set with Mummers in Blackface Makeup, 1909. African American mummers regularly competed for prizes on Broad Street between 1901 and 1929, and African American composer James Bland wrote the parade’s unofficial theme song, “Oh! Dem Golden Slippers.” However, the mummers in later years developed a reputation for racial insensitivity. Many mummers marched in blackface makeup until the city banned the practice following civil rights protests organized by Cecil B. Moore and the Philadelphia chapter of the NAACP in 1963. 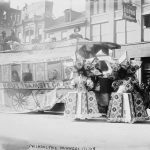 In this 1909 streetcar set, mummers in blackface makeup lampoon the movement to integrate streetcar service, one of the signature civil rights struggles of nineteenth-century Philadelphia. 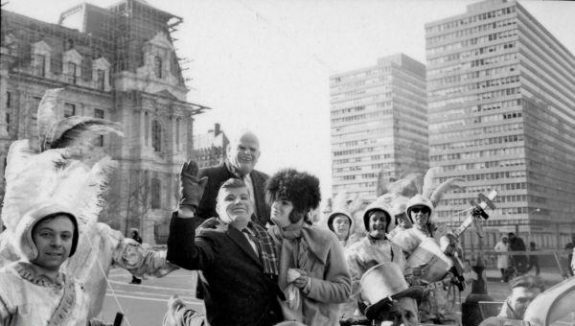 Political satire has long been a staple of the Mummers Parade, as shown in this photograph of mummers costumed as President John F. Kennedy and First Lady Jacqueline Kennedy on January 1, 1963. 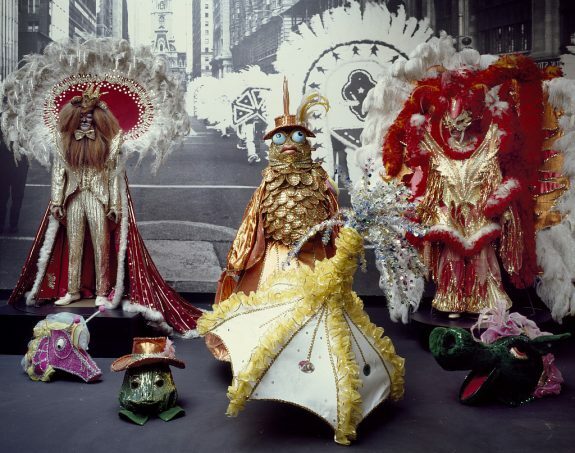 These costumes at the Mummers Museum, photographed in 1980, display the artistry and imagination typical of fancy club costumes in the Mummers Parade. 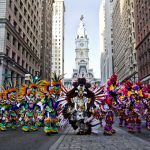 The mummers and their New Year’s Day Parade are uniquely Philadelphia, and the Mummers Museum at Second Street and Washington Avenue is dedicated to celebrating the mummers clubs, costumes, and movable scenery that have marked New Year’s Day in Philadelphia since 1901. 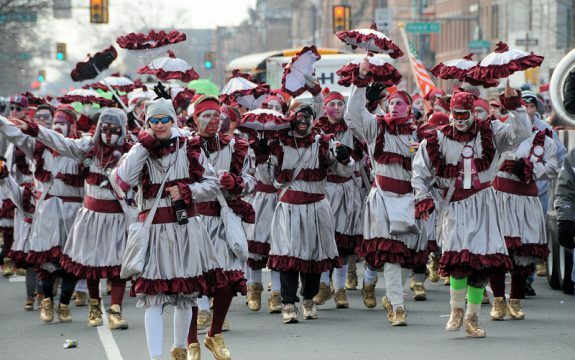 The wenches are one of five categories of costumed competitors in the Mummers Parade, usually accompanied either by a live brass band or a vehicle blaring string-band music. Until 1964 wenches almost always wore blackface, suggesting a connection between the mummers wench and the “wench act” of the early 1840s, a burlesque form of gender impersonation performed onstage by white men in black makeup, often in the context of the antebellum minstrel show. In addition, the signature “strut” of the mummers wench—a high, walking step, traditionally danced while swinging a parasol through the air—is derived from the cakewalk, an antebellum plantation dance popularized in northern cities at the turn of the twentieth century. 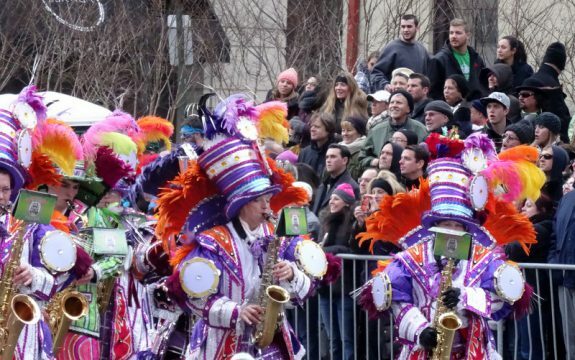 Spectators who arrive early at the University of the Arts, seen here in 2014, get choice standing room to view the Mummers Parade on Broad Street. Traditionally, certain points along the route are designated for musical brigades to perform, and paradegoers jockey for position, as the routines provide the pinnacle of parade-watching. 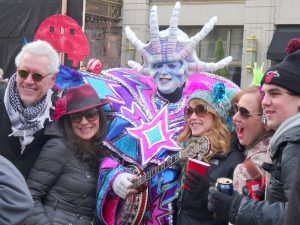 For many Mummers Parade spectators, posing with a mummer is part of getting the new year off to a good start, and most mummers are happy to comply with—and even encourage—requests for a pose. It's all part of the celebratory atmosphere. Because of the informal and unhurried pace of the parade, mummers often meander to the sidelines for picture-taking, and it's not unusual for spectators to wander out into the street for quick shots with parade captains or other elaborately-costumed participants. 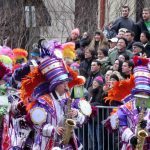 The Mummers Parade, an institution in Philadelphia since 1901, brought together many of the loosely organized groups of folk performers who roamed the streets each year between Christmas Eve and New Year’s Day. 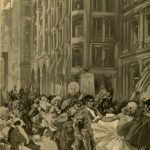 Known variously as mummers, shooters, belsnickles, fantasticals, and callithumpians, these masqueraders traced their roots to immigrants from England, Sweden, and Germany who introduced mumming to pre-Revolutionary Philadelphia. The original route of the Mummers Parade stretched up Broad Street from South Philadelphia to Cecil B. Moore Avenue (then known as Columbia Avenue) in North Philadelphia. Beginning in the 1920s, the Mummers Parade terminated at Girard Avenue, which shortened the parade route by five blocks. 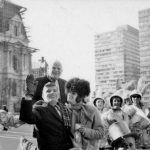 And after 1967, the mummers excised the North Philadelphia portion of the parade altogether, ending their march at the judging stand at City Hall. This contraction of the official parade route dovetailed with the emergence of the unofficial, post-parade celebration in front of the clubhouses on Second Street (or “Two Street”) south of Washington Avenue, where many mummers groups met and rehearsed throughout the year. The comic division (or “comics”), focusing on satire and clowning. The wench brigade division (or “wenches”), emphasizing a traditional, burlesque style of female impersonation. The string band division (or “string bands”), featuring live music by large ensembles of banjoes and brass. The fancy club division (or “fancies”), displaying elaborate costume design. The fancy brigade division (or “fancy brigades”), concentrating on Broadway-style staging and choreography. 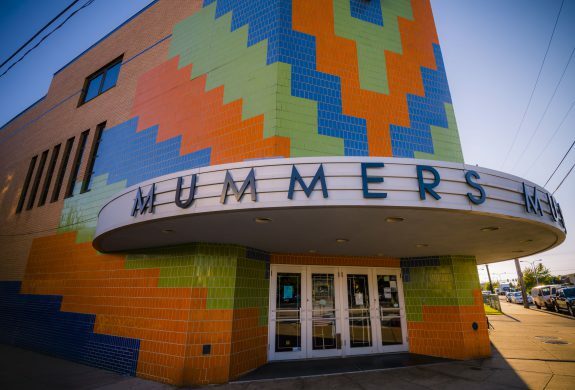 Until World War II, a plurality of mummers hailed from South Philadelphia, especially from the neighborhood’s Irish American and Italian American enclaves. 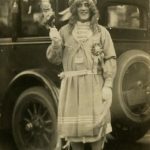 Kensington and Port Richmond were also well-represented in the early twentieth-century Mummers Parade, and beginning in the 1950s, mummers clubs sprang up throughout the region, especially in Northeast Philadelphia and the New Jersey suburbs. African American mummers regularly competed for prizes on Broad Street between 1901 and 1929, and African American composer James Bland (1854-1911) wrote the parade’s unofficial theme song, “Oh! Dem Golden Slippers.” However, the mummers in later years developed a reputation for racial insensitivity. Many mummers marched in blackface makeup until the city banned the practice following civil rights protests organized by Cecil B. Moore (1915-79) and the Philadelphia chapter of the NAACP in 1963. In the early decades of the twenty-first century, blackface still appeared at the nighttime party on “Two Street,” after the official parade, and both the burlesque “wench” costume and the mummers’ “strut” (the signature dance step of the parade) originated on the minstrel-show stage. 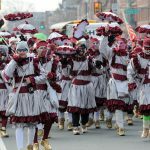 In 2013 the Joseph A. Ferko String Band celebrated the mummers’ connection to minstrelsy with a controversial parade routine titled “Bringin’ Back those Minstrel Days,” performed in brown rather than black makeup to avoid censure by the judges. Despite its troubled racial history, the Mummers Parade grew considerably more diverse and inclusive after 1963. In the 1970s most mummers clubs began admitting women as performers for the first time. Women had long worked behind the scenes, helping to stitch the mummers’ costumes, and one woman—a newspaper reporter named Laura Lee—snuck into the parade in 1929. In 1984 the Goodtimers Comic Club, with an African American president and hundreds of minority members, started competing in the parade. And in 1992 a group of Cambodian American artists and students teamed up with the Golden Sunrise Fancy Brigade to stage a Khmer dance drama on Broad Street. 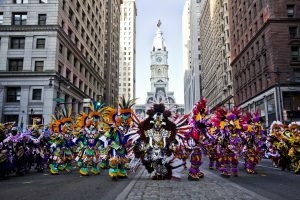 At the behest of the Philadelphia Human Relations Commission, the 2016 Mummers Parade included a new, noncompeting unit called the Philadelphia Division, organized with the explicit goal of making the parade more diverse. Participants included a Mexican American carnival organization, an African American drill team, a Puerto Rican bomba group, and a brigade of drag queens. Although most mummers clubs embraced the growing diversity of the parade, reports of individual marchers using racist and homophobic slurs along the parade route complicated efforts to make the Mummers Parade more inclusive. 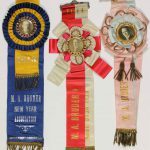 By the early twenty-first century, the Mummers Parade drew roughly eight thousand marchers and fifty thousand spectators on a typical New Year’s Day, and hundreds of thousands of viewers watched the parade on local television. Until the financial crisis of 2008-9, the city of Philadelphia offered roughly $350,000 in cash prizes to be divided among all but the lowest-scoring groups in the parade. 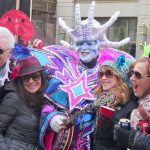 The withdrawal of city support forced the mummers to turn to corporate sponsors, including Southwest Airlines and SugarHouse Casino, to reimburse the city for the extra police and sanitation services that the parade required. 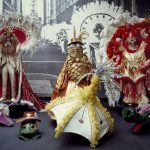 In addition, almost twenty mummers clubs closed or consolidated during and after the 1990s, under pressure from dwindling membership, shrinking audiences, and the rising cost of mounting a parade performance. 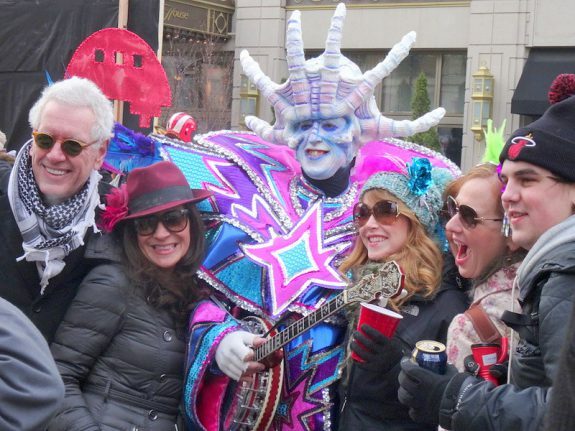 Despite these challenges, the mummers maintained a strong record of resilience. Since 1901 the Mummers Parade has been canceled only twice, in 1919 and 1934 (although weather has sometimes forced a delay in the parade until the Saturday after New Year’s). 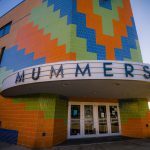 The Mummers Museum opened in 1976 to mark America’s bicentennial, a symbol of the mummers’ contribution to regional and national culture. When the number of spectators for the Mummers Parade started to decline, the city moved the parade route from Broad Street to Market Street to boost attendance—first in 1995, and again from 2000 to 2003. In addition, the fancy brigades began competing indoors at the Pennsylvania Convention Center in 1998, which allowed fans to enjoy their performances without enduring the cold temperatures outside. 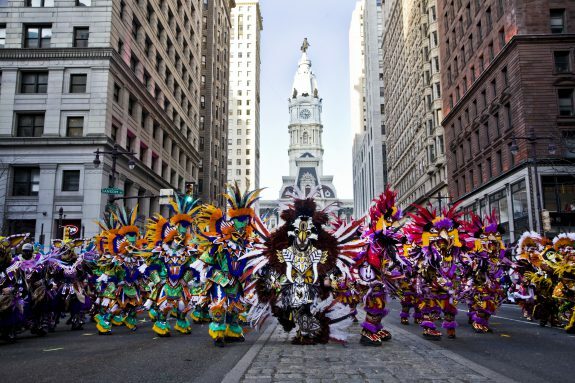 Many mummers resisted these changes, but faced with ongoing membership declines and stagnant audiences, the mummers decided to reverse their parade route in 2015 by beginning at the City Hall judging stand and proceeding southward along Broad Street. (The wenches opted out of this route change, insisting on a traditional northward march). This literal change in direction reduced the gaps between performances at popular viewing spots in Center City, boosting the size of the crowds and demonstrating the mummers’ willingness to adapt to the evolving tastes—and shortening attention spans—of the twenty-first century. Christian DuComb, Ph.D., is assistant professor of theater at Colgate University and the author of Haunted City: Three Centuries of Racial Impersonation in Philadelphia (University of Michigan Press, 2017). He performed as a comic in the Mummers Parade from 2009 to 2012. Cockrell, Dale. Demons of Disorder: Early Blackface Minstrels and Their World. Cambridge, U.K.: Cambridge University Press, 1997. Davis, Susan G. Parades and Power: Street Theatre in Nineteenth-Century Philadelphia. Philadelphia: Temple University Press, 1986. Kennedy, E.A., III. Life, Liberty, and the Mummers. Philadelphia: Temple University Press, 2007. Leighton, Corey Elizabeth. “Strutting it up through Histories: A Performance Genealogy of the Philadelphia Mummers Parade.” Ph.D. dissertation, Louisiana State University, 2009. Rothberg, Andrea Ignatoff. “Philadelphia Mummery: Individual Rewards and Social Interaction.” Ph.D. dissertation, University of Wisconsin-Madison, 1980. Shoemaker, Alfred L. Christmas in Pennsylvania: A Folk-Cultural Study. Mechanicsburg, Pa.: Stackpole Books, 1999. Sponsler, Claire. “Philadelphia’s Mummers and the Anglo-Saxon Revival,” in Ritual Imports: Performing Medieval Drama in America. Ithaca, N.Y.: Cornell University Press, 2004. 68-94. Welch, Charles E. Jr. Oh! Dem Golden Slippers: The Story of the Philadelphia Mummers. Philadelphia: Book Street Press, 1991. Wong, Deborah. “Taking (to) the Street: Cambodian Immigrants in the Philadelphia Mummers Parade,” in Speak It Louder: Asian Americans Making Music. New York: Routledge, 2004. 53-68. Urban Archives, Temple University, Samuel L. Paley Library, 1210 Polett Walk, Philadelphia. Frank Dumont Minstrelsy Scrapbook (1850-1902), Historical Society of Pennsylvania, 1300 Locust Street, Philadelphia. As for the corporate sponsorship, even that is nothing new. Before the city began subsidizing the parade in 1901, local businesses around the city provided the cash prizes, realizing that outrageous costumes and marching bands were good publicity.